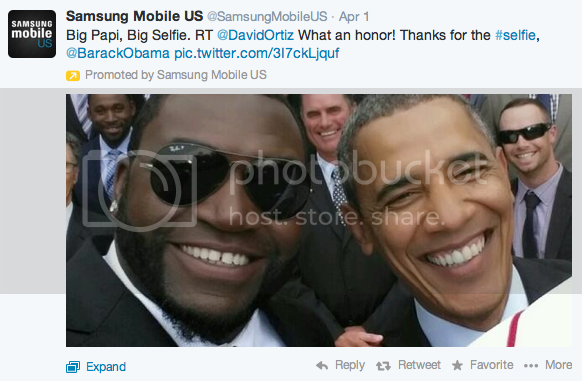 Weeks after Samsung pulled off the $18 million selfie heard around the world, the telecom giant celebrated a new deal with the Red Sox' David Ortiz by helping facilitate the presidential selfie during the Sox' White House visit on Monday. In two days, Papi's selfie has been retweeted nearly 40,000 times and naturally got a big RT to Samsung's 5 million+ followers. While one might presume this was a staged shot similar to Samsung's Oscars stunt, Samsung says otherwise. In a statement released yesterday, the company says: "When we heard about the visit to the White House, we worked with David and the team on how to share images with fans. We didn’t know if or what he would be able to capture using his Note 3 device."